The question that has to be asked is where the line is between using all the information they have acquired to provide better service and alienating passengers who feel they've become intrusive. As they probe new capabilities, carriers are confronting a nettlesome question: How much personal data can be used to enhance customer service before slipping into the “too much information” realm, where a traveler may feel uncomfortable? Airlines are really good at some things—like people movement, aircraft maintenance, and keeping passengers safe. They’re also experts at collecting vast mountains of customer data, including what sorts of credit cards and computers you use, how often you fly, and where and how much you spend on all the extras. If you’re stressing over a tight connection, flight attendants can usually tell you which gate to run toward, how much time you have, and whether your next flight is on time. But they may also know if you were stuck in Buffalo for six hours last week because of a delay, and offer a personal apology. They can even tap their data hoard to make sure there’s plenty of red for the 2 million-miler who drinks only cabernet, or upgrade the woman on standby who got stuck in economy because she usually flies first class. The swankiest hotels have long employed this strategy: If you feel special and loved, maybe you’ll come back. Now the airlines have jumped on the bandwagon.The industry has long envisioned a day when it could make use of all the information it’s accumulated on you. That data has traditionally been segregated in various IT systems, but now many airlines are gradually funneling it into a customer service strategy—with flight attendants becoming the face of hyper-personalized service. But as they probe these new capabilities, some carriers are confronting a nettlesome question: How much personal data can be used to enhance customer service before slipping into the “too much information” realm, where a traveler may feel uncomfortable? In April, Delta Air Lines Inc.’s 23,000 flight attendants began using new software called SkyPro on their Nokia Lumia mobile devices to keep tabs on some basic customer information. You’ll get an apology if your flight last week was delayed, for example. Or a thank you if you just hit 200,000 miles for the year. Or, say, a flight attendant spills some coffee on your skirt: The tools will allow him to award you some frequent flier miles or a future travel voucher on the spot. 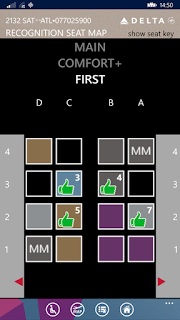 On the Nokia devices, each seat of a flight is color-coded. A green thumbs-up for passengers Delta wants to thank or congratulate, a red check if the airline wants to apologize for a recent service mishap. American Airlines Group Inc., the world’s largest carrier, equips its 24,000 flight attendants with Samsung Galaxy Note devices. Early next year, American will release a new app called iSolve to let flight attendants dispense frequent-flier miles or a travel voucher to help resolve customer service issues onboard. United’s flight attendants also track tight connections, mileage milestones and other customer matters with company-issued iPhones. “We want to stay one step ahead of them, if you will, by using our big data when things go wrong or when things are going great,” said Allison Ausband, Delta’s senior vice president of in-flight service. Like other carriers debating how to employ “big data” through new digital tools, Delta is exploring where the creepy factor lies in all this customer insight. For example, should a flight attendant wish you a happy birthday? What about appearing with a bloody mary because you ordered the drink on nine of your last 10 flights? What if you’re sitting beside your boss this time? And should flight attendants’ notes on high-value customers be updated and distributed companywide? Right now, they’re not, but what has begun as making use of information they had anyway could soon become a targeted accumulation of data on your travel persona. Do we want to feel like we’re under the microscope every time we fly? Will we order that second drink? Even watch a racy movie? Entertainment isn’t being tracked as of yet, but creating a big brother environment may not make for happy customers, which after all, is the point of the exercise. “It’s a feel-good thing, but it’s also in the mind of the consumer, ‘If they know my birthday, what else do they know about me?’” said John Romantic, American’s managing director of flight service. Atlanta-based Delta considers its knowledge of customers’ preferences a “strategic advantage,” Ausband said. The airline is also trying to increase its number of daily “recognition events,” which vary based on flight duration and whether a route is more of a business or leisure market. Delta is hardly alone when it comes to using its customer intelligence, with every big international airline exploring how to tailor its approach more specifically. Flight attendants at British Airways, part of the International Consolidated Airlines Group SA, have used iPads since 2011. The airline developed more than 40 apps for various customer service aspects of a journey, including those that allow cabin staff to recognize “high-tier customers,” spokeswoman Caroline Titmuss said. Via the iPads, a flight attendant can also note troubles—such as whether a specific meal order wasn’t delivered—so that the airline will offer an additional apology after the flight. British Airways Customer Service Manager Zoe McCurry using an iPad at London Heathrow. Two years ago, Singapore Airlines Ltd. cabin crews began using tablets to customize their service and to create digital “voyage reports” after each flight. In this service landscape, many airlines will also grapple with how widely to distribute this kind of digital interaction. Is it wiser to focus on the “high-value” customers in premium cabins or attempt to include the entire airplane? Flight attendant time, after all, is a very finite resource. One Asia airline that employs Boxever even plans to offer immediate upgrades if your luggage gets mislaid, O’Flanagan said, owing to the rapid evolution of bag-tracking technologies. As carriers develop greater proficiency in coordinating customer data, expect to see more personal apologies—and free drinks or bonus miles—awarded on board. You might even get a happy birthday wish—without mentioning your age, of course.